Above is an image that our lead designer and co-owner Andi Kubacki created, called "Deco Daisy Arial." The graphically infused retro-organic feel was achieved by layering two images. 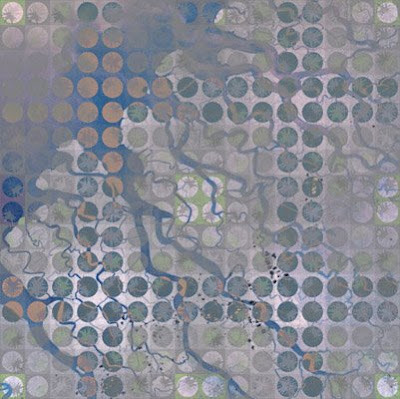 The first image used for the wallpaper design was an aerial shot of the Ganges Delta. The satellite image reveals the branch-like structure of all the small tributaries. Layered over the photo is a graphic pattern created by Andi called "Deco Daisy". The pattern was fleshed out with blue and green hues, highlighting the floral touches accenting the hard circular and square structures. Though both the photograph and the graphic design are strong on their own, the layering of the two creates a new look that has never been seen before. The floral accents of the pattern merge with the arms of waterways, creating the look of a flowering tree. Cool blues and lavenders set off red accents. We have created a number of designs within this framework of merging natural, organic photographs with graphic patterns that give a nod to '70s wallpaper patterns. They're our Exclusive Designs, you can see the collection at www.greatwallonline.com/exclusive.